In the world of remote controlled vehicles, I have always thought of helicopters as the most volatile. Flying a helicopter in real life takes an incredible amount of skill and precision. Flying a remote controlled replica of a helicopter takes a well constructed toy and smaller amounts of skill and precision. 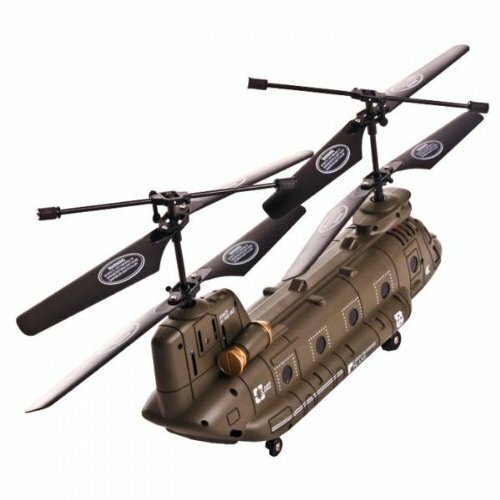 This Syma New S022 Big CH-47 Chinook can soar through the error and transport your toy army men to safety, if you can manage to get it off the ground. In my own experience, it is about a 50/50 shot for a remote controlled helicopter to actually fly. If the controls are too loose or the props are too flimsy, the vehicle will simply spin in circles and you never get to perform any serious maneuvers with them. This Chinook has had a whopping 93 reviews on Amazon, so it appears that a good number of consumers have purchased one. Their take? On the whole it appears to be mostly positive, with one reviewer stating “This thing is well worth the price, it is TONS of fun. Everyone wants to fly it. It’s great to set-up landing areas and scenarios and stuff.” Others run the gambit between a great helicopter and a piece of junk. At a price of $44.04, I would expect moderate performance but it’ll likely need a few tweaks to fly right. If you pick one up and have your own two cents to add, let me know. If you are the more cautious type, a safer bet is going with a remote controlled vehicle of a different kind. You can get a pretty solid truck in a similar price range, for example, including something like this remote controlled SUV that has a water cannon located just under the hood. There is something to be said about chasing down your friends and shooting them with water from up to 15″ away, am I right? If you want to go a little more exotic, you can checkout the Discovery remote controlled snake, which provides both education and fun with a rattler replica.